The Sverdlov-class cruisers, Soviet designation Project 68bis, were the last conventional gun cruisers built for the Soviet Navy. They were built in the 1950s and were based on Russian, German, and Italian designs and concepts developed prior to the Second World War. They were modified to improve their sea keeping capabilities, allowing them to run at high speed in the rough waters of the North Atlantic. The basic hull was more modern and had better armor protection than vast majority of the post World War Two gun cruiser designs built and deployed by peer nations. They also carried an extensive suite of modern radar equipment and anti-aircraft artillery. The Soviets originally planned to build 40 ships in the class, which would be supported by the Stalingrad-class battlecruisers and aircraft carriers. This class of cruiser satisfied Stalin's and Soviet Navy leadership's desire to create a ship that was in keeping with a Soviet Naval doctrine focused on supporting the defense of the Russian coastline, operating out of naval bases worldwide and protecting Arctic, Baltic, Mediterranean and Black Sea interests. A secondary commerce raiding and political presence mission in the third world was also envisioned for this class of ship. They were considered obsolete by Soviet Premier Khrushchev and Soviet Defence staff for the missile age in which defensive and anti submarine resources were the priority and only grudgingly conceded to allowing some cruisers for limited roles as flagships in strategic and tactical naval operations. 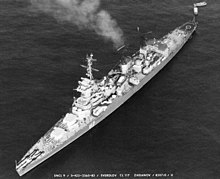 Within the Soviet Navy, leading Admirals still believed in 1959 that more big cruisers would be useful in the sort of operations planned in Cuba and support of Indonesia. And the Sverdlovs were a threat to the British and Dutch Navies which lacked 24 hour day night, carrier capability before satellite surveillance. The big ship threat was real and useful in justifying conventional fleet and carrier construction to the Royal Navy, especially in the North Atlantic. Britain responded by introducing the Blackburn Buccaneer, a carrier-based strike aircraft that had the performance required to approach and attack Sverdlov class ships at ultra low level, using toss bombing attacks to deliver nuclear ordnance, while remaining outside the 5 km lethal range of the Russian 100mm and 37mm guns. When the building program was cut back and the battlecruisers and carriers were cancelled, the Sverdlovs were left dangerously unprotected when operating in areas outside the cover of land-based aircraft. Their secondary mission, operating on their own as commerce raiders, was also compromised as they would be extremely vulnerable, in good weather, to USN Carrier Battle Groups equipped with modern strike aircraft and the remaining Baltimore and Des Moines-class cruisers equipped with 8 inch guns. The Royal Navy's last, Colony and Tiger class gun cruisers, and the USN's Gearing and Forrest Sherman class destroyers, lacked armour and range and speed required to counter the Sverdlov. In 1954 Sverdlov class construction was cancelled by Khrushchev after 14 hulls had been completed. Two additional hulls were scrapped on the slip and four partially complete Sverdlovs launched in 1954 were scrapped in 1959. The remaining ships in the Soviet Fleet remained in service through the 1970s, when they underwent a limited modernization program before finally leaving service in the late 1980s. Only the Mikhail Kutuzov is still preserved, in Novorossiysk. The project to build the Sverdlov-class cruisers was formally approved on 27 May 1947. The first three ships of the class were named after cancelled ships of the Chapayev class. Thirty ships were originally ordered; however, upon Joseph Stalin's death in 1953, this order was cut to 21 in 1954. Once the first fifteen hulls were laid down, orders for a second group of 6 ships was modified to include provisions for protection against nuclear fallout, but none were completed. Plans were developed and drawings were created to upgrade the ships to support a cruise missile capability; however, these plans were dropped and new construction was cancelled in 1959; incomplete ships were all scrapped by 1961. Reductions in cruiser force levels was contrary to the views of Soviet Navy leadership, who insisted cruisers still provided a valuable capability to act as command ships for naval gunfire support of amphibious operations. They also thought they would provide a political presence in contested areas of the third world, e.g. Cuba and Indonesia. Had more Sverdlovs been available at the time of the Cuban Missile Crisis in 1962, they would certainly have been deployed. The Soviet Navy intended to base several older Chapayev class cruisers at Cuban ports, had the operation succeeded. These ships were outclassed as surface combatants, due to their lack of an anti-ship cruise missile capability. The limited modernization of those ships still in service in the 1970s relegated them to service as naval gunfire support platforms. The standard Soviet practice was to pass the cruisers in and out of reserve status. Most were relegated to a reserve status by the early 1980s. Today, only one of the ships remain: the Mikhail Kutuzov. It is a museum ship in Novorossiysk. The Sverdlov-class cruisers were improved and slightly enlarged versions of the Chapayev class. They had the same main armament, machinery and side protection as the earlier ships, but had increased fuel capacity for greater range, an all welded hull, improved underwater protection, increased anti-aircraft artillery and radar. The Sverdlov class displaced 13,600 tons standard and 16,640 tons at full load. They were 210 metres (689 ft 0 in) long overall and 205 metres (672 ft 7 in) long at the waterline. They had a beam of 22 metres (72 ft 2 in) and draught of 6.9 metres (22 ft 8 in) and typically had a complement of 1,250. The hull was a completely welded new design and the ships had a double bottom for over 75% of their length. The ship also had twenty-three watertight bulkheads. The Sverdlovs were had 6 boilers providing steam to two shaft geared steam turbines generating 118,100 shaft horsepower (88,100 kW). This gave the ships a maximum speed of 32.5 knots (60.2 km/h; 37.4 mph). The cruisers had a range of 9,000 nautical miles (17,000 km; 10,000 mi) at 18 knots (33 km/h; 21 mph). Sverdlov-class cruisers main armament included twelve 152 mm (6 in)/57 cal B-38 guns mounted in four triple Mk5-bis turrets. They also had twelve 100 mm (3.9 in)/56 cal Model 1934 guns in six twin SM-5-1 mounts. For anti-aircraft weaponry, the cruisers had thirty-two 37 mm (1.5 in) anti-aircraft guns in sixteen twin mounts and were also equipped with ten 533 mm (21 in) torpedo tubes in two mountings of five each. The Sverdlovs had 100 mm (3.9 in) belt armor and had a 50 mm (2.0 in) armored deck. The turrets were shield by 175 mm (6.9 in) armor and the conning tower, 150 mm (5.9 in) armor. The cruisers' ultimate radar suite included one 'Big Net' or 'Top Trough' air search radar, one 'High Sieve' or 'Low Sieve' air search radar, one 'Knife Rest' air search radar and one 'Slim Net' air search radar. For navigational radar they had one 'Don-2' or 'Neptune' model. For fire control purposes the ships were equipped with two 'Sun Visor' radars, two 'Top Bow' 152 mm gun radars and eight 'Egg Cup' gun radars. For electronic countermeasures the ships were equipped with two 'Watch Dog' ECM systems. By the early 1960s, the torpedo tubes were removed from all ships of the class. In 1957 the Admiral Nakhimov had a KSShch (NATO reporting name: SS-N-1 "Scrubber") anti-ship missile launcher installed to replace "A" and "B" turrets. The modification was designated Project 68ER. This trial installation was not successful and the ship was rapidly decommissioned and used as a target ship in 1961. Dzerzhinsky had a SAM launcher for the M-2 Volkhov-M missile (SA-N-2 "Guideline"), which replaced the aft turrets in 1960-62, with the designation Project 70E. This conversion was also considered to be unsuccessful and no further ships were converted. As the entire missile installation was above the armored deck and the missile itself, based on the S-75 Dvina (SA-2 "Guideline"), was liquid-fueled (acid/kerosene), it would have represented a serious hazard to the ship in action. Zhdanov and Senyavin were converted to command ships in 1971 by replacing the "X" turret with extra accommodation and electronics, four twin AK-230 30 mm guns, and a 4K33 "Osa-M" (SA-N-4 "Gecko") Surface-to-Air Missile (SAM) system. Senyavin also had the "Y" turret removed to make room for a helicopter deck and hangar, and four additional AK-230 mounts installed atop the Osa-M missile system. Zhdanov and Senyavin were respectively designated Project 68U1 and Project 68U2. Oktyabrskaya Revolyutsia was refitted with an enlarged bridge in 1977, with Admiral Ushakov and Aleksandr Suvorov receiving the same modification in 1979, and later, Mikhail Kutusov. These ships had four of their 37 mm twin mounts removed, and eight 30 mm AK-230 mounts were added. These ships were designated Project 68A. Sverdlov Свердлов Baltic Shipyard, Leningrad 15 October 1949 5 July 1950 15 May 1952 Stricken 1989 Named after Yakov Sverdlov. On 14 February 1978 it was relegated to the reserve and stationed at Liepaya. On 30 May 1989 it was decommissioned, and in 1990 towed to Kronshtadt. In early 1991 it was sold to an Indian company for scrap, and in October 1993 towed to India and scrapped. Zhdanov Жданов Baltic Shipyard, Leningrad 11 February 1950 27 December 1950 31 December 1951 Stricken 1991 Named after Andrei Zhdanov. It was converted into a command ship with the "X" turret removed, replaced by office space and extra electronics added. It was then scrapped in 1991. Aleksandr Suvorov Александр Суворов Baltic Shipyard, Leningrad 26 February 1951 15 May 1952 31 December 1953 Stricken 1990 Named after Alexander Suvorov. Scrapped 1990. Dmitry Pozharsky Дмитрий Пожарский Baltic Shipyard, Leningrad 31 March 1952 25 June 1953 31 December 1954 Stricken 1987 Named after patriot Dmitry Pozharsky. Scrapped 1987. Ordzhonikidze Орджоникидзе Admiralty Shipyard, Leningrad 19 October 1949 17 September 1950 30 June 1952 Broken up, 1972 Named after Sergo Ordzhonikidze. Sold to Indonesia 1962, recommissioned KRI Irian in 1963. Sold for scrap to Taiwan in 1972. British frogman Lionel Crabb disappeared in 1956 when secretly inspecting this ship for MI6 when it was docked in Portsmouth Harbour. Dzerzhinsky Дзержинский Nikolayev 31 December 1948 31 August 1950 18 August 1952 Stricken 1989 Named after Felix Edmundovich Dzerzhinsky. On 19 February 1980 she was relegated to the reserve and stationed in Sevastopol; Decommissioned 12 October 1988; 1988-1989 scrapped at Inkerman. ^ Gibson, Chris (2015). Nimrod's Genesis. Hikoki Publications. pp. 17, 41–42. ISBN 978-190210947-3. ^ Chris Bishop and Tony Cullen (1988). The Encyclopedia of World Sea Power. Crescent Books. p. 81. ISBN 0517653427. ^ a b Michael Holm, Sverdlov class, accessed May 2014. Gardiner, Robert; Chumbley, Stephen; Budzbon, Przemysław, eds. (1995). Conway's All the World's Fighting Ships 1947-1995. Annapolis, Maryland: Naval Institute Press. ISBN 1-55750-132-7. Wikimedia Commons has media related to Sverdlov class cruiser.